The spirit, the enthusiasm, the laughter—there's a lot of humor here. The leadership team is amazing, so we can all together make a real difference and that's what it's about for me. 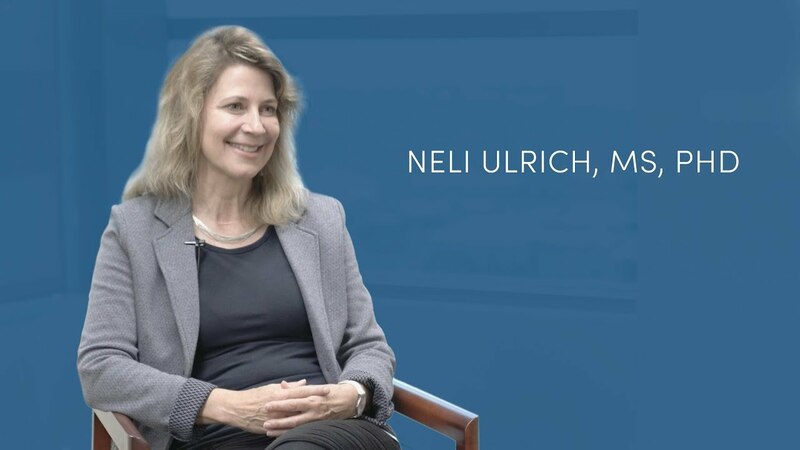 I'm Neli Ulrich and I'm the director of the Comprehensive Cancer Center at Huntsman Cancer Institute. What brought you to the United States? Most people know that I'm German. I grew up there and went to school and started university there as well—I started with a Master's in nutrition. I kind of by chance came over with a Fulbright scholarship to Oregon State University. I really got exposed for the first time to women in science, in leadership positions, women faculty. None of that existed in Germany and so I realized that I could have that career and a family, so I decided to stay. My first goal was to become a waitress. I really admired waitresses. I always wanted to be one. Waitresses, they were always friendly and kind, they brought me great food [laughter] and they were able to juggle a lot of things. How do you unwind from all the juggling you do yourself? First of all, I love my dog. It's a golden doodle and the only other woman in the house. I love nature and ideally I go out camping or backpacking with the family—backpacking really being far away without email or anything—it's perfect here in Salt Lake City for all of that. What’s something your colleagues might not know about you? There's one thing I'm unusually competitive about: I like to make cakes that are very well and fancy decorated. Once a year at Easter, we have an Easter brunch where a student of mine and myself make the best decorated cakes. What do you look forward to at Huntsman Cancer Institute? Now, my role has broadened and I'm very excited to work with a lot of people. Meeting with everybody, the spirit, the enthusiasm, the laughter, there's a lot of humor here, and the collaboration. It's just, it's really fun here. The leadership team is amazing so we can all together make a real difference. Learn more about Dr. Ulrich's research at HCI.